Issue 43: REVisions… Why Not? If you are somewhat new to Revolution flying (or, you don’t get out very much with others), you will eventually come across someone’s handles that have multiple knots on the tie points of the handles. At first glance it may look a little pointless, but, with those knots, you can adjust for specific types of flight, such as more forward pull or a stronger ability to reverse. Or you can compensate for minor differences in line lengths without having to remeasure the lines. 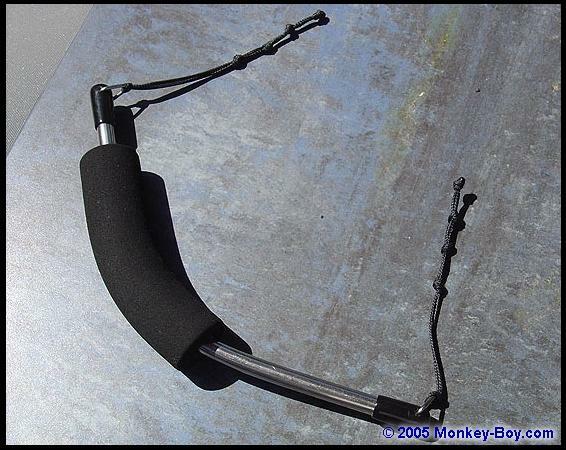 These take less than 20 minutes to make a set for your handles. Every set of handles I own uses these now and it’s come in handy more than a few times. Here’s how to make your own set. First of all, here’s what you will need to do this. For the line, I used 250 lb. Laser Pro Dacron sleeving… It’s light weight and it doesn’t have a core, but anything that’s about the same size as the tie point line we’re removing will work fine. You can make these longer than 18 inches, but I found with that length, you had enough room to tie 4 knots and leave a reasonable amount of the loop to tie to the handles. Take one of the pieces and fold it in half. 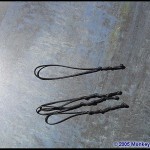 Now, take the ends and tie a knot with them as a pair, leaving as little material as possible on the end of the knot. Pull this tight with the needle-nosed pliers. 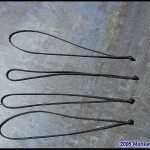 Ideally you are looking for as small a knot as possible, and as smooth as possible. Using the scissors, trim the ends neatly and then melt them a little bit with the lighter. Once you’ve done all four, you’ll end up with four lines that look like the picture shown below and they will be very close to the same length. Next, we’ll start tying the knots onto one of the loops. Decide how many loops you want and how far apart you want them. I usually aim for adding three knots, with a half inch between the knot centers. Finish one of these first, and then use only that one as the template as you tie the knots in the next three loops. This will keep all four consistent with one common loop. Count on each knot taking approx. 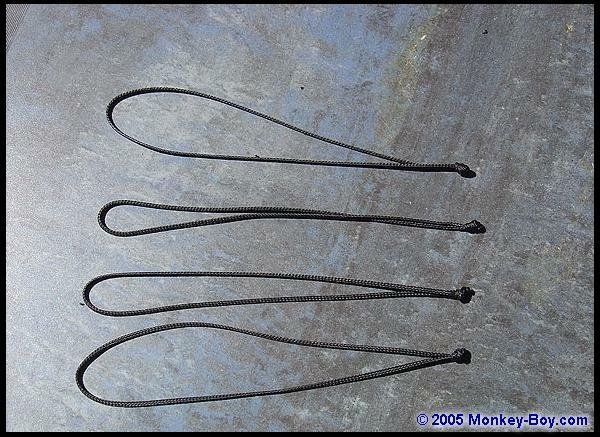 1/2 an inch of the total length, so when you are done, your loop will be 7 inches long. Once you tied all four, line them up on a table and make sure the knots are aligned with each other. 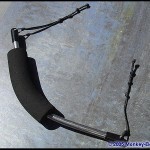 Once you have are finished, grab your Rev handles, and attach the new loops to the handles with a larkshead knot. I push the loop down through the top metal ring and the bottom up through it so that the knot will lie very smoothly against the metal. Pull them as tight as you can, and with that, you are done and it’s time to try them out on a Rev. 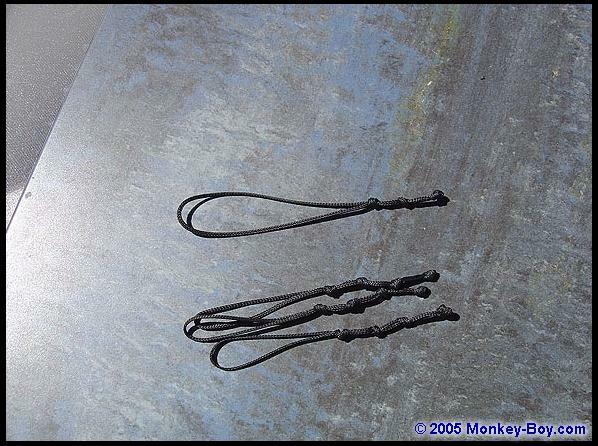 Set your Rev up as you usually would, and when you are connecting the lines to the handles, use the first knot for all four lines. Put the kite up in the air and make sure it’s flying as you’d expect. Now, land with the leading edge down, and get a feel for how much reverse is needed to make the Rev back up 2 feet off the ground. Land the kite again, and move the bottom lines back one knot back on each handle. Play around with reverse again and you’ll notice it’s a little easier now. Try moving the knots further back (or, move the ones on the top back instead) and you’ll get a more dramatic effect. This is an excellent trick to gain better control of your reverse flying technique. Also, you can use the knots to adjust for lines that may be differing lengths, letting you tune the kite to an even balance between the top and bottom lines. ** Editor’s Note: Because of the Revolution’s angle of attack when flown on even length lines, some veteran Rev fliers elect to use a longer leader on top (complete with extra knots), and only a single knot (or “pigtail”) on the bottom… Also, you might experiment with having the top knots only 1/8″ apart for even finer adjustments. If you have any questions or ideas with respect to this article, or you are feeling compelled to send me your Beautiful Evil Dragon Rev, contact me directly by clicking on my name below. This entry was posted in 2005, General Topics, Issue 43 (Jul/Aug), Kite Columns, KL Archive, Quad Line and tagged handles, leaders, pigtails, rev, revolution.